If you want a prom look that is unique and lovely, consider opting for a Victorian-style gown. There are lots of ways you can incorporate classic Victorian-era fashion elements into modern gowns that will turn heads on prom night. You don't need to wear a costume to channel the opulence of the Victorian era. In fact, according to Hollywood stylist James Cornwall of Cornwall Styling, rocking the old-fashioned look is all about balance. "Look for dresses that have a Victorian flair, but don't feel like you have to have an original Victorian dress," Cornwall says. "Fashion is always influenced from the past, so incorporate it in your look without letting it rule." If you love vintage Victorian fashion for prom, choose dresses that feature Victorian-era elements. A corset bodice defines the waist, making any body type look more feminine and alluring. 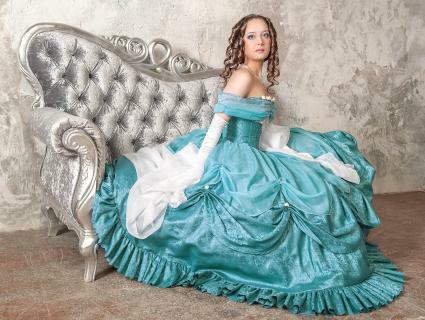 There are lots of corset prom dresses to choose from, but for maximum Victorian impact, look for a gown with a full, princess-style skirt that further emphasizes the narrow waist. "Choose a dress that has a corset style bodice with a princess visual," says Cornwall. "It's a great way to mix a Victorian feel with glamour and not seem as though you are trying too hard or dating the look." According to Victoriana Magazine, an overskirt, or second skirt layered over the top of the dress, was a popular element in Victorian gowns of the 1880s. This isn't a common feature in contemporary prom gowns, and it really calls to mind past eras. The FairOnly Strapless Prom Dress from Amazon.com is a modern option with this iconic overskirt. The taffeta and organza dress features a strapless, fitted bodice with a side-draped overskirt. It comes in four beautiful colors that would look lovely on any skin tone, and it is available in sizes extra small through extra extra large. This gown, which has more than 70 glowing customer reviews, retails for around $80. Also consider the Strapless Ball Gown from Quinceanera Dress City. This gorgeous dress has an elaborately bustled overskirt that packs major Victorian punch. The modern strapless bodice, jeweled embellishment, and sleek lines on top give this an of-the-moment feel. This gown comes in more than 30 colors of taffeta and sizes 2 through 26W. It retails for just over $200. The traditional Victorian high neckline doesn't have to make you look like a schoolmarm, especially when it's crafted from sheer lace or coupled with a sleeveless design. The key to keeping this covered-up look stylish is to choose other elements of the gown that are classic and elegant. The Long Sleeves Lace Applique Beaded Mermaid Evening Gown from TBDress is a gorgeous choice that has plenty of Victorian charm. The neckline is high, but the form-fitting bodice keeps it from feeling too demure. Black lace appliques, a floating mesh skirt, and a slight train amp up the old-fashioned romance. This stunning option comes in sizes 2 through 26W and retails for about $150. Another sweet option is the Victorian Bustle Ball Gown Party Dress from Amazon.com. With its high lace neckline and corset-style lace-up bodice, this gown is full of Victorian style elements. However, the lace trim and princess shape are beautiful and timeless. It comes in four colors and sizes up to XXL. It retails for about $190. Bustles are another iconic element of Victorian fashion, and these elaborate gathered backs bring old-fashioned glamour to contemporary prom styles. While the gigantic rear bustle of a 1890s fashion plate might not have a place at prom, there are plenty of modern takes on this Victorian element. The Satin V-Neck Victorian Bustle Ball Gown from Vintage Dress is a stunning option, available in four gorgeous colors. The beautiful gown has a pointed bodice with black lacing, unique ruffled sleeves, and a jaw-dropping, full bustled skirt. Because of the modern v-neckline, this gown has a high fashion look instead of appearing like a costume. It comes in a variety of sizes for $260. Another sweet dress is the Floor Length Ball Gown from DHGate. This strapless option is a more modern take on the bustle style, but the draping, sweeping train, and defined waist call to mind Victorian splendor. This satin dress is offered in dozens of gorgeous colors and comes in sizes 2 through 28W. It retails for about $130. A slight train was very popular in the later Victorian era, and there are many prom gowns with this feature. Make sure you choose one that isn't too modern in silhouette if you want to emulate this era. The Capped Sleeved Sheath Evening Gown from Elizabeth K is a great choice if you want to channel the late 1800s while still remaining current. This beautiful lace dress has a beaded bodice with a high neckline and cap sleeves, and it has an elegant, sweeping train. It comes in sizes L through 4XL. It retails for just under $400. For a completely different look that still has some 1800s style, consider the Vintage Gorgeous Tulle Crochet Flowers Appliques High Neck Sweep Train Ball Gown Dress from DressWe. This over-the-top style features a sleeveless high neck bodice, a full ball gown skirt, and a small train. The entire bodice is covered in crocheted flowers. Available in dark navy, this stunning dress comes in sizes 2 through 26W and retails for about $150. 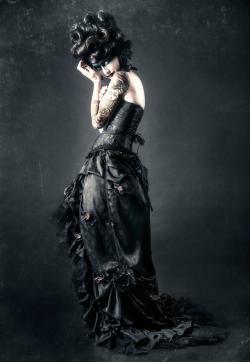 For a modern take on Victorian style, nothing beats steampunk fashion. Mixing mechanical elements, fashion from the 1800s, and a bit of science fiction, this is a trend worth trying at prom. The Steam Punk Ball Gown from GrandmasStorybrook is a dream come true in gold floral damask. The strapless bodice has a sleek, contemporary silhouette, coupled with lace details and a slightly dropped waist. The full skirt stands out in poufs of gleaming fabric. This stunning option comes in sizes 8 to 10. It retails for just under $450. A more modern option is the Airship Elegance Ball Gown from auralyne. This dress is made to order and features leather and metal details, a corset and a high-low hem that are a classic part of steampunk fashion. The bodice features a black velvet corset while the skirt features appliqued satin and a bustle in the back. This dress retails for less than $600. No matter how ornate your dress, Cornwall stresses the importance of keeping the rest of your look simple. "If you are going full Victorian style with your prom dress, you should look at styling your hair with a more modern style and doing a simple makeup look," he says. "If you try rocking era hair and makeup, it will look like a costume." Now that you know the look, find the perfect vintage prom dress to fit your style.